On a spring-like afternoon in February, Fran Owens, Ms. Senior Massachusetts 2007, arrives at the Grosvenor Park Nursing Center in Salem wearing a white knee-length Marabou feather coat, bright pink lipstick, and a sparkling tiara nestled in a cascading blond wig named Pamela, one of 26 in her collection. Owens, 67, steps out of her faded blue Toyota minivan in strappy red sandals with clear 2-inch heels. She is scheduled to sing for a group of senior citizens in roughly 15 minutes, a job that she says gives her more satisfaction than any gig she’s ever had during her 39-year career as a nightclub singer and entertainer. “The appreciation of the seniors — when you go into the facilities where they can’t go out to see a Broadway show, when you see their eyes and you see the smiles and you see how much they appreciate it, it’s worth more than all the money you can make,’’ she says. Her best friend, Pamela Kiriaji, 59, for whom Owens named her Dolly Parton-like bouffant wig, is waiting for Owens in the parking lot. “She’s a little off the beam, but I don’t know what I would’ve done without her,’’ Owens says. Since falling on a patch of ice last October and injuring her back, Owens says she has not been able to do any heavy lifting and is grateful for Kiriaji, who often helps her with equipment: two portable speakers, a mini disc player and a catalog of more than 600 songs from the ’20s to the ’60s. 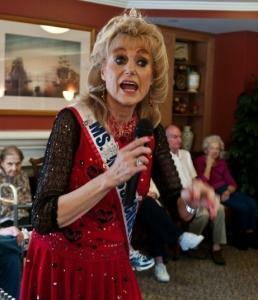 As the Grosvenor Park residents assemble in the activities room, forming a chaotic semi-circle of approximately 40 wheelchairs and walkers, Owens, her Ms. Senior Massachusetts pageant banner draped across her wispy frame, twinkles in a short bedazzled red dress that reveals a dancer’s shapely legs. Despite one or two dozing seniors in the back row, it is clear that Owens is a natural in the spotlight as she engages the audience throughout her performance, offering her wireless microphone to several shaky voices as they sing along to “You Are my Sunshine’’ and “Bicycle Built for Two’’ with unabashed concentration. “They look forward to seeing Fran come. They miss her when she doesn’t come,’’ says Lina Brogna, activity coordinator, who has worked at Grosvenor Park for the past 15 years and says music brings the residents a lot of warmth and love. Growing up the youngest of five children in the small town of Bingham, Maine, Owens won her first talent show at the age of 4 and says she competed in singing, dancing, and baton twirling contests throughout her adolescence, none of which she recalls losing. “The real truth about me is that I was to New England what Shirley Temple was to the world,’’ Owens says of her childhood. Owens, an 11-year Somerville resident, says she was recently selected to represent Maine in this year’s national pageant due to her hometown roots in Bingham. After her Ms. Senior Maine 2011 coronation this spring, Owens will compete — in her second effort — for the Ms. Senior America crown in Atlantic City in October. She has already purchased more than 1,000 rhinestones at a craft supply store for her evening-wear gown, which she is designing as part of Frantastic Creations, her unofficial clothing line. “When I walk on stage, it’s going to do nothing but sparkle,’’ Owens says. Shortly before her marriage to DiCicco, Owens walked away from her career as a singer and entertainer in 2000, trading in glitzy cocktail dresses for a security guard’s uniform at IBM, where she worked for three years. It wasn’t until 2004, when she discovered her value in the senior world, that she picked up her microphone again. Operating on a sliding rate scale — based on a facility’s budget — Owens has been performing at assisted living centers, nursing homes, and adult day care centers throughout New England since 2006, and says she is committed to making a difference in the lives of senior citizens.